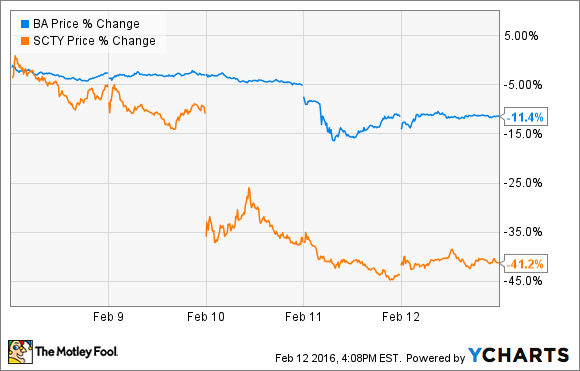 Boeing sank to a two-year low, and SolarCity got crushed amid a down week for the markets. 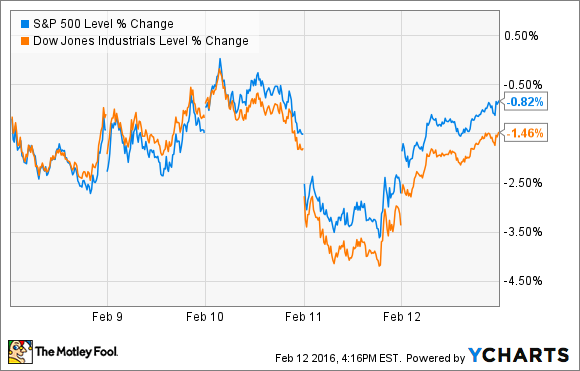 As we've grown accustomed to in recent months, the markets last week followed oil prices, which moved higher Friday. That helped the Dow Jones Industrial Average (DJINDICES:^DJI) and S&P 500 (SNPINDEX:^GSPC) recover some losses from earlier in the week, but they still finished 1.46% and 0.82% lower, respectively. On the bright side, economic data showed that retailers got off to a good start for 2016 despite the huge snowstorm that slowed the eastern part of the U.S. during January. U.S. retail sales increased 0.2% in January, with cars and Internet products driving the gain. Further, December retail sales were revised higher to show a 0.2% gain compared with the previously reported 0.1% decline, according to the Commerce Department. Here's a look at two companies making major moves last week. Although The Boeing Co. (NYSE:BA) is well-poised to take advantage of a commercial aircraft market expected to grow significantly globally over the next two decades, its shares were slammed midweek when it was announced that the Securities and Exchange Commission will investigate Boeing in regard to its program accounting methods for the 787 Dreamliner and 747 aircraft. That news quickly led to a sell-off of Boeing's stock, which forced the price to its lowest level in more than two years. What's important to know is that Boeing's "program accounting" is completely GAAP compliant and has been used for decades. It basically enables the company to average out its massive upfront costs for its commercial aircraft programs over the lifespan of the project. Boeing celebrating a 787 Dreamliner coming off the production line. Image source: Boeing Co. The issue is that over the span of the project, if Boeing underreports costs or overstates its sales potential, the company could intentionally or unintentionally be making its results look better for investors. Boeing's 787 Dreamliner, which as a product has been a hit, as a program has checked in over budget and has had multiple delays at certain stages. Some analysts have gone as far as to say that Boeing may have poured so much capital into the program it may never have the necessary margins and sales to become profitable. For reasons like that, it's understandable that the SEC would want to make sure Boeing is properly accounting for its costs and potential sales. While it's futile to speculate about the outcome for this development, it's clear some investors aren't willing to wait around and find out. Switching gears, SolarCity Corporation (NASDAQ:SCTY.DL) had a brutal week, with its shares trading more than 40% lower during the five-day stretch. The pain train started early in the week, when SolarCity reported fourth-quarter earnings. Despite posting revenue and profit that beat analysts' expectations, investors sold the stock thanks to a worse-than-expected net loss for the quarter thanks to a larger-than-normal seasonal slowdown that equated to a decline in installations. The company had guided for installations to reach 280 megawatts to 300 megawatts during the quarter but fell 8 megawatts short of the low end of that forecast. Then, to make matters worse later in the week, analysts at Barclays downgraded the stock to an "equal weight" rating and put a $20 price target on the stock. That said, upgrades and downgrades should be taken with a grain of salt, and the real focus will be if the company can hit its full-year installation guidance and expectations to generate cash flow in 2016.